Turtles kept in captivity often develop fungus on their shells because of an unsanitary aquarium. It is important to keep your turtle's tank very clean or else it may not only develop a fungus infection, but it could also die of a bacterial infection. On the other hand, some people mistake baby "skin fungus," which is natural shedding, for green fungus, which indicates a problem. If your turtle's tank has green slime throughout, then it is safe to assume that your turtle also has fungus growing on it. Look for green fungus on the turtle's shell and around its aquarium. If you see white, fuzzy lumps on a turtle's back, it may simply be skin cells shedding. Remove the turtle from his living area and scrub his tank down thoroughly. Remove all traces of green fungus or mold in the cage. Brush your turtle with a soft toothbrush moistened with water and some gentle soap, like Dove. Remove as much fungus as possible and rinse and dry him thoroughly. 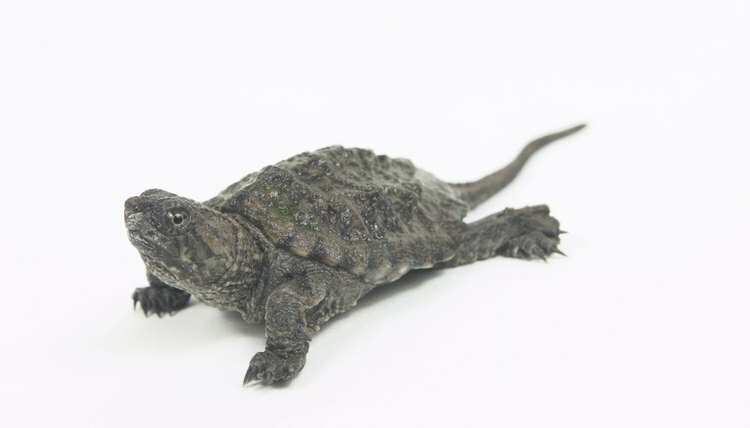 Wipe his shell with a solution that is 5 percent iodine to treat a fungal infection. Let it dry completely and repeat the process for two consecutive weeks. Dip your turtle in a bowl that contains two tablespoons of aquarium salt in a gallon of clean water. Allow it to dry on his skin. The salt will inhibit fungus growth. Let him bathe in this mixture twice a day for five days straight. Provide a dry spot for your turtle in his aquarium, preferably a rock that is under a heating lamp. Light and heat inhibit fungus. Clean his tank once a week to prevent fungal growth. Remove half of the dirty water and replace it with clean water, which will allow "good" bacteria to flourish while preventing fungus from growing. See a veterinarian if your turtle is lethargic or has cracks or redness on his skin or shell.